Over 20 years representing the entire Hunter Douglas product line and the exclusive Alustra Collection. Also a very common question we get is “what window covering treatments are available to cover my sliding patio door”. 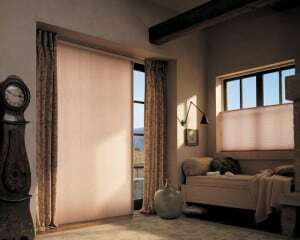 There are many window treatments to consider, from a simple vertical blind, that being the most common and usually the least expensive to a host of other shades, blinds and fabric treatment ideas. Our experienced window treatment specialists can come right to your home or business at no charge and show you all the window covering options that you might want to consider for your home or business.